On May 8, 2015 the Minister of Foreign Affairs of Georgia Mrs. Tamar Beruchashvili held a meeting with the President of Parliamentary Assembly of the Council of Europe Ms. Anne Brasseur. During the meeting, the sides discussed issues of cooperation between Georgia and the Council of Europe Parliamentary Assembly, the situation and human rights violations in the occupied regions of Abkhazia, Georgia and Tskchinvali Region/South Ossetia, Georgia. 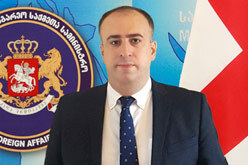 The Georgian Foreign Minister also stressed the importance of an active engagement of the international organizations in the ongoing process, in order to have a possibility to monitor and observe the human rights situation in the occupied territories of Georgia.